We all have go-tos that never let us down: watching Friends for a laugh, having a martini for breakfast, dining at the local Mexican place for dinner. For me, it’s my favorite pair of perfectly worn jeans. Every time I put the soft, light blue denim on, I know exactly how they’ll fit. While they aren’t the fanciest pair, their quality, consistency and comfort make me wear them all the time. That’s how I feel about Kushy Punch’s 100mg indica gummy. Kushy Punch sources their cannabis from local California farmers using ethical and sustainable growing techniques. Next, the brand produces full-spectrum cannabis oil using short path distillation. Knowing the extraction process can rob cannabis of its full flavor and terpene profile, Kushy Punch reintroduces specific cannabinoids and terpenes into their cannabis oil, post extraction, to provide a consistently robust high and complex taste. Here we’ll review the recently compliant 100mg indica plum gummy in detail. Will it continue to deliver the quality and consistency I remember, or fall short? Let’s start eating and find out! 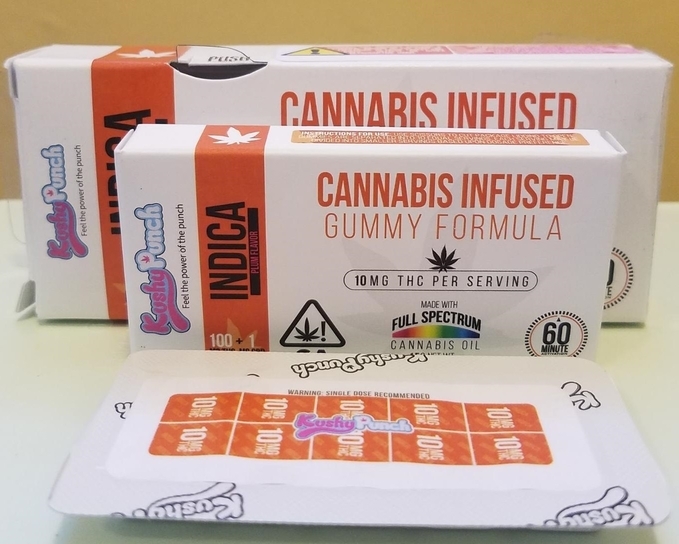 While the 100mg indica gummy’s three-layer packaging feels like you’re trying to unlock Pandora’s Box, it’s clear your safety is a priority. The colorful multi-layered boxes are full of helpful info: dosage, health warnings, ingredients, manufacturing and best-by dates, THC:CBD ratio and more. Unfortunately, there’s no lab testing info, but Kushy Punch’s website does post updated lab results breaking down cannabinoid content and provides details on pesticide testing. This info is more than many other brands offer, so I’ll take it! After you pull out the slide, you find the next package–a thinner cardboard box that mimics a kid’s crayon box you’d find at a restaurant, fitting easily inside your pocket. Although “full spectrum cannabis oil” is mentioned, I would love to see a breakdown of cannabinoids and learn more about the cannabis used in the extraction. With all the care Kushy Punch takes to protect them, it’s no surprise their indica gummies deliver a potent high. 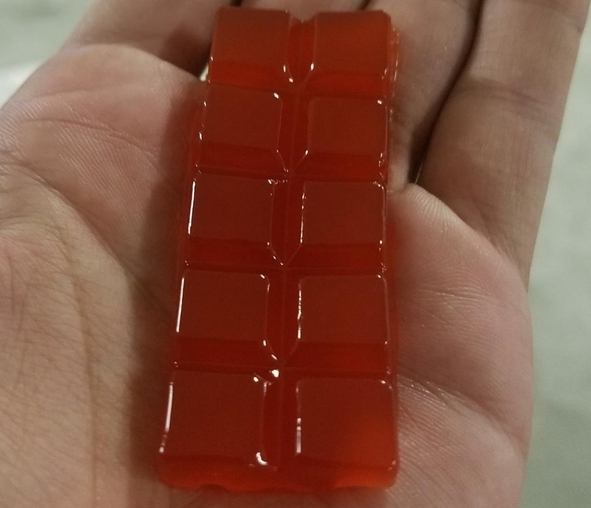 Once you get them out of the somewhat strenuous second packaging, peel back the plastic to reveal a pre-divided red slab with 10 square pieces each containing 10mg THC and .1mg CBD. Lost or trashed the boxes? There’s a dosing chart right on plastic pack ensuring you get a proper even amount. I used scissors to separate the red, plum-flavored pieces (a butter knife works too); just remember you might get some sticky residue on your fingers. If you need less than 10mg to start and have a tough time accurately dosing the predetermined squares, hardening them in the freezer for five minutes makes cleaner cuts and virtually no remnants. The texture is soft and squishy, almost like Jell-O, but not annoyingly sticky like many marijuana gummies. I love how these melted in my mouth, didn’t stick in my teeth and contained only a light cannabis taste. Because Kushy Punch uses full spectrum cannabis oil and reintroduces terpenes after extraction, the cannabis flavor is bold yet not aggressive. The earthy plant flavor melds nicely with the plum, toning down the fruit’s sweet and tart complexity. An hour later, with a 50mg dose, my shoulders roll back, my jaw unclenches and my tongue separates from the roof of my mouth. Nearly five hours in I found myself slightly slurring my speech and dozing off on the couch. Even though this is a powerful indica gummy, I could microdose any time of day to melt away stress, anxiety, and sore muscles. Great to try before bed or during a relaxing day watching visually arresting films like Planet Earth. But not Blue Planet; those deep-sea creatures are scary as hell. At $16, this is a solid price for an effective and consistent 100mg edible. Heavier infused chocolate bars with the same amount of THC typically cost $5 to $10 more. A sound investment. Three layers keep the gummy well protected. Outer package is small enough to hold in your hand with its clever child-resistant design that utilizes a plastic slide. Second layer is a smaller and thinner cardboard box. Final peel-back plastic packaging includes a dosage chart. All three feature visually stimulating colors and graphics. Well-utilized space to provide ample information. Details such as allergy warnings, nutrition info, government warnings and dosing instructions are included. Front side contains THC contents, indica classification, plum flavor, serving size, net weight, how long it typically takes to take effect, and a note it’s made of full spectrum cannabis oil. Back contains an ingredients list, manufacturer name, license number, batch number, date of manufacture, best by date, and THC and CBD contents. Phone number with no explanation. I’d like to know more about the extraction and a more detailed cannabinoid breakdown. Gummies have indentations help make dosing precise. A bit tricky to accurately divide in increments less than 10mg; freezing them for a few minutes and using a sharp knife helps ensure equal, smaller pieces. Outer and inner boxes have bold indicators that this is a cannabis edible. If you’re just carrying the innermost package, it can go unnoticed in your hand unless someone notices the peel-back sticker/dosing chart. Cannabis oil flavor wasn’t overpowering. Gummy tasted sweet and tart, like a plum, with a hint of cannabis (I didn’t mind it at all, in fact, I kind of liked it). The soft gummies broke apart in my mouth and tasted more like Jell-O than anything. Went down smooth and easy, leaving a slightly sticky residue on my hand. Next time I’ll just eat it out of the container since I have the tolerance to eat the whole package. Noticed an overall happy demeanor, chuckling to myself while watching a movie. Enjoyed my high until I fell asleep about five hours after consumption. Not too many recipes this could be added to. Kushy Punch has been around for years; these gummies are tried and true. Always find myself coming back to these for their fun-loving, consistent effects. Priced at $16, it’s a pretty good price for this 100mg edible. For the same amount of THC in edible form, you often have to pay close to $10 more. I can rely on this 100mg Kushy Punch indica gummy like I can rely on those favorite jeans or a purely hypothetical morning cocktail. When I buy their brightly branded box(es) I’m getting quality–the ingredients they use, the cannabis they source, the high they deliver–Kushy Punch has yet to let me down. For under $20 you get a reliable, pre-divided plum flavored edible with limited cannabis taste that relaxes and helps you rest. 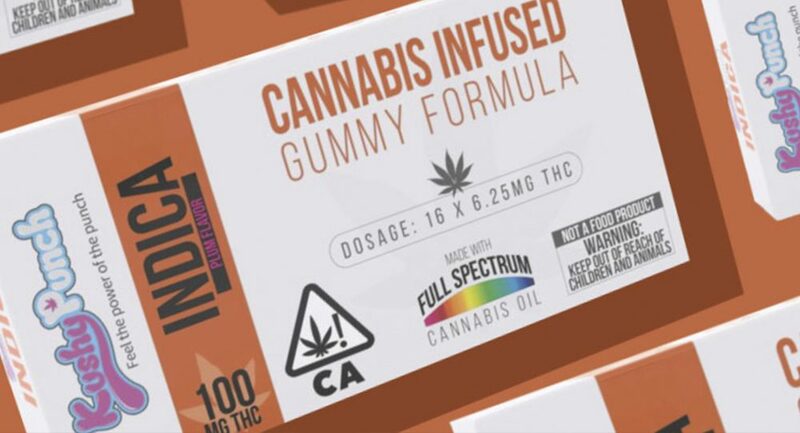 The brand is just like I remember: synonymous with the go-to cannabis gummy. Visit the Nugg Marketplace and search your local dispensary to have this Kushy Punch 100mg indica gummy delivered right to your doorstep!